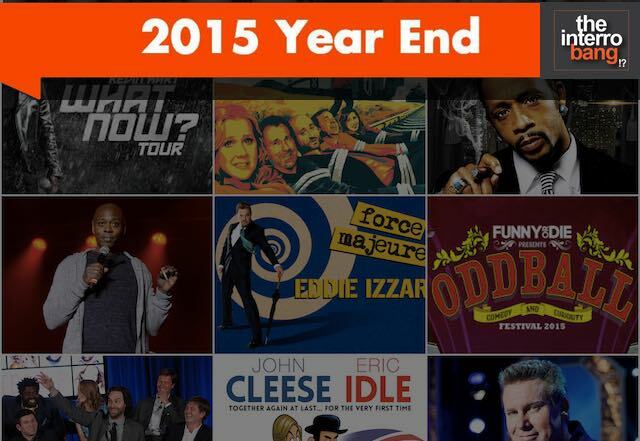 Gigantic was the word in comedy tours in 2015. Some tours broke records for the size of the venue, others for the incredible number of celebrated performers, and still others were gigantic because of how many cities of the world they hit, or because the tour has been going on forever! All ten tours gave people all over America the chance to see some of our greatest touring comics live in theaters, arenas, and other venues across the country. 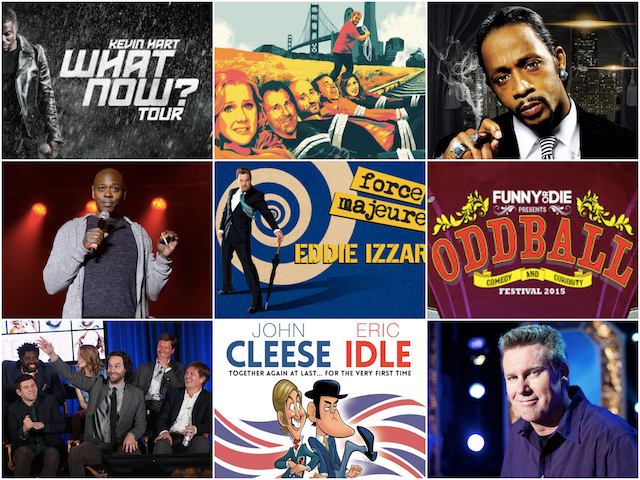 Here are our top comedy tours of 2015. Let us know who you are picking for #1. Eddie Izzard has been on this impressive tour since March of 2013 and it is considered the most extensive tour ever. Izzards plan with the show was to take him to 25 countries on 5 continents and then even do all 50 states over in the United States. This 16 City Tour had the duo performing 22 shows in 31 days for all of October 2015. John Cleese and Eric Idle promised fans that no two shows would be quite the same because of the format of the show. The show included mixing imporvised and scripted bits with storytelling, musical numbers, sit-down comedy, and even exclusive footage. They even offered fans a Q&A during the show. Brian Regan’s “Never Ending Tour” continued on in 2015 with Regan doing 41 cities just in the Summer and Fall leg of his tour. What made it so special this year? Not only did he perform at Radio City, but he also recorded his special live which aired on Comedy Central as he performed it. Funny or Die presented “The Oddball Tour”, a touring Comedy Festival that traveled 18 cities from August 28th to October 18th. The tour was headlined by two of todays biggest stars in comedy, Amy Schumer and Aziz Ansari. Featured on the show were also some of the best performers out there, comics like Dave Attell, Jim Norton, Michael Che, and Sebastian Manascalco are just a few names off of the amazing lineup. Trainwreck was undoubtedly one of the biggest movies of 2015, Amy Schumer put together a tour with 5 other comics featured in the film. It was a 7 city tour that ran from June 13th to June 21st with each show raising money for a different charity. Dave Attell, Colin Quinn, Judd Apatow, Mike Birbiglia, and Vanessa Bayer were all featured on the tour. Kevin Hart not only had another monster year the movies with films like Get Hard and The Wedding Ringer, but he put on one of the biggest comedy tours of all time. The tour saw Hart perform in 97 different city’s starting on March 9th and culminating on New Years Eve, but he is still going after that. The tour also featured Hart performing and selling out Madison Square Garden. 2015 was a big year for the cast of Undatable on NBC. The show wrapped up a successful second season, but also premiered a fourth season with a whole new concept. The show would be completely live every Friday with no delay. To promote the show, the comics the show stars went on a 9 city tour from March 15th to the 31st. Undatable’s main cast members Chris D’Elia, Brent Morin, Rick Glassman and Ron Funches all took part in the tour. Katt Williams ended 2015 with the beginning of his new “Conspiracy Theory” tour where he performed in 14 cities from October 2nd to November 22nd. Williams promised fans that the tour will have at least 50 dates. Since Dave Chapelle made his comeback to stand up after disappearing for so long his popularity and talent have not went down at all. Not only did he take a stand against cell phones at shows by using a new smart phone security system but he quietly announced a fall tour that ran from September 14th to October 7th and saw Chapelle do 26 shows in 15 cities.